perfect for squishy baby toes. it is a dream I never thought would come true. easier than I had imagined. so much better than I ever hoped. now that I am a quilter and no longer a quitter. Love love love it! Go you. It turned out beautiful! Wow! It's beautiful! nice work! So beautiful, I absolutely love it! Beautiful model too! It's beautiful! This is something I would love to learn to do. Very beautiful job on the quilt! OMGosh I love it!! So little girl perfect! how big is the final quilt? I think it's just gorgeous and yes, this is my first comment! 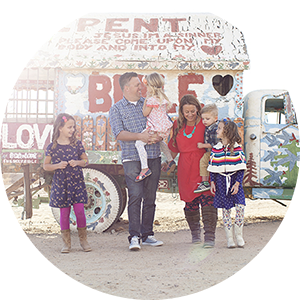 Love our blog! It looks so great! I really need to get working on mine! Thanks for sharing it! it's beautiful!!! I am so inspired to try and make one. I think I will have my mother in law help me. Love it! and wee one is just ADORABLE!!!! Yay! It looks SO perfect for you! So your style! Bet you were going for that, huh?! hehe! You are one talented cookie! Did you do the binding, or did the Backyard Quilters do it. I love that you are using your quilt. Why have it be a decoration. It is meant to be used. Yea Julie!! I can't wait to have a few extra hours to get to work on mine and send it away. Can you share a bit more about your experience with Backyard Quilters? Prep you did, turn around, the quilting you choose ... it looks like a floral pattern? I love it ... you've motivated me to make time for mine so it'll be ready come fall/winter :). Lovely! You will have that forever. That is so very beautiful, and it seems as if you won't be the only one enjoying it! be proud girl 'cause this one is a doozie! love it! Love it!! You did a fantastic job! Can't wait till mine is finished! That turned out beautiful. I love how colorful it is and a cute baby always make me smile. I made my first quilt last year and have used it almost every day...and I had mine quilted and bound, too! Congratulations! Your first quilt...you should be proud! It is truly a piece of art! What an heirloom to leave your daughters! this is immensely beautiful, truly inspiring. Almost makes me brave enough to try making one myself. Oh my it's ahhhmazing! Love it so much. That quilt is beautiful! I love the colors! So, you made the quilt and then had had the top stitching stuff done? That is beautiful. I would so love to learn how to do it. That is so beautiful, I love the colors. Super job! I LOVE the colors, so bright and fun, perfect for playing under in the shade on. I just found your blog today via the Fab K design giveaway post. I am following you as well! What a beautiful quilt. It is sad when people put them away. They are to be used and loved! I really like the bright colors, it is very "summery"! I am so envious...it is gOrGeOuS!!!! Way to go, you quilter, you! 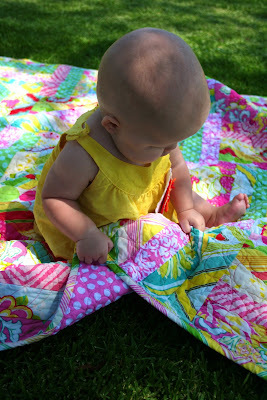 Your quilt is beautiful but not as gorgeous as your precious baby!!! Have a fabulous day chicky!! Oh my goodness! I love it! I love all those fabrics & colors! I am wanting to get into quilting soon and I hope to make one that pretty one day! you've inspired me! 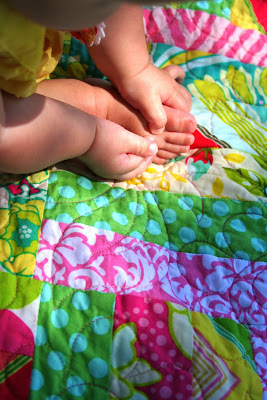 i want to make two quilts for my girls to have as they grow up. awesome job! Beautiful! I completely agree that quilts are meant to be used, not looked at.... that's how memories get made! My heart about stopped the first time my mom pulled out HER gradma's quilt for my kids to take on a picnic but now I realize it's something so special to share with them. I love the colors you chose. Great job!!! It is so beautiful - I loooove the colors! Your quilt turned out so beautiful! I can't blog mine yet, as it is a gift. Love the photos too adorable. What a great job! Love your fabrics. Love it! Please tell us what to do before sending it to them. Love that idea! It looks great. Isn't piecing so easy and fun. I love it. If only fabric wasn't so expensive! I love the colors and fabric choices. Very girly! LOVE IT! I've bought my fabric but never gotten started...here's to doing that this weekend! :) You did a fabulous job! Out of curiosity - what size did yours end up? Love, love, love it! Great fabric picks too!